Ford purposely gave its new Escape crossover a decisively more car-like design. Not only did its North American customers indicate this was their preference, but the discontinuation of the Focus (and the rest of Ford’s car lineup, save for the Mustang) opened the design doorway for a softer and more aerodynamically designed crossover. The new 2020 Escape looks more wagon-like than ever. Not everyone is a fan of this, but Ford will be offering up a solution about six months after the Escape goes on sale later this year: the so-called Baby Bronco. The latter’s existence is no big mystery and we may have already seen it in pre-production form, but Ford deliberately decided to split the outgoing Escape’s personality into two: on-road and off-road. 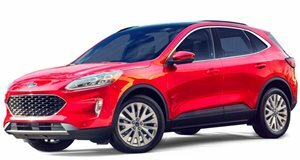 The Detroit Bureau recently spoke to Ford executive vice president of product development and purchasing, Hau Thai-Tang, regarding the specific design differences between these two crossovers, which share the overseas-only Focus’ underpinnings. "We want to have really differentiated styling (with the new model so the Escape’s) silhouette is very sleek, dynamic – more progressive. The off-road utility will be more upright, boxy,” he said. Where the new Escape has a more "urban” look, its unnamed platform twin will be more rugged. Even Chinese consumers favor a more dynamic appearance than North American Escape customers, hence the decision to give the Escape a slightly different look for China only. We also expect the Baby Bronco (again, not its official name) to have additional features to make it more suitable for mild off-roading. Although it’ll ride on a front-wheel-drive platform, all-wheel-drive might even be standard. What would be the point of the crossover’s claimed ruggedness and boxy design in an FWD configuration? With conventional cars soon to be out of the picture, Ford is now in a position to further differentiate its crossover lineup into two categories for different customer tastes.